St. Giles became a cathedral when Charles 1st (1600-1649) reintroduced Bishops to this Presbyterian Scottish church, however in 1688 it lost its Bishop during the "glorious revolution" but has always retained the name. This cathedral is named St. Giles after a sixth century Frenchman who became the patron saint of cripples and had many churches dedicated to him during the middle ages. He gained this patronage whilst living in a wood where he was friends with all the animals. One day a deer who had been shot by the King came running to him and he protected it. During an English raid in 1385 St. Giles was badly burnt, but after its rebuilding, it grew in splendour. Since then St. Giles has constantly been changing and growing. In 1416 a higher roof and clerestary windows were added and the building had an eastern extension, while in 1495 the Crown Spire was added. During the reformation it underwent further changes when the Calvinist followers of John Knox stripped the interior of its Catholic decorations and white washed the walls. 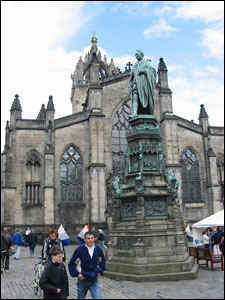 There stands to this day a statue of Knox at the entrance who was a minister of the cathedral from 1560-1572. The next major change was when the cathedral was rearranged so that there was four separate churches inside. However in 1883 the Lord Provost Chambers unified them again. Then in 1911 the Thistle Chapel was added, built for Scotlands order of chivalry. The Thistle chapel was designed by Sir Robert Lorimer who was subsequently created a Knight Bachelor. It was designed in the style of high Gothic architecture of the 15th century, and the chapel and its anti chapel celebrate the three themes, Christianity, Scotland, and Chivalry. This chapel came about in 1905 after Ronald the Earl of Leven and Melville, and newly appointed Knight of the Thistle, wanted to fund the building of a Chapel of the Thistle, which was to become the spiritual home of Scotlands order of chivalry. He tried to get it built at Holyrood which failed, but after his death his sons proposed to fund the building of the chapel at St. Giles. Permission was granted, and from 1909-1911 the building of the Thistle Chapel commenced. You can see to this day the arms of Leven and Melville next to the door of the chapel in Ronalds memory. To get to the chapel you must first pass through a preserved 15th door arch and into the anti chapel where the names of the Monarchs and Knights from when King James the seventh ruled until the building of the chapel adorn the walls. Above on the ceiling can be seen fifty seven carved stone bosses, which provide only a taste of what is to come for in the main chapel there are ninety eight stone carved bosses and a further fourteen at the edge of the ceiling. Within the chapel are nineteen stalls the pinnacles displaying the crests of the present members, two royal stalls and the tallest and grandest which is the sovereigns stall. Built entirely out of Scottish materials the only additions to the furnishings since it was built are the holy table and cross. At the heart of the cathedral is the sanctuary where the holy table and pulpit are surrounded by the four massive central pillars which support the tower and the crown steeple. These date from 1120 making them the oldest part of St. Giles. 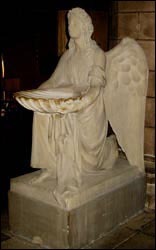 The pulpit carved by John Rhind in 1883 acts as the central focus depicting the six acts of mercy. At the far side of the sanctuary lies the chancel which was built in the 14th and 15th century although there is archaeological evidence of foundations dating earlier, and on the other side of the sanctuary when you walk into the cathedral is the nave. Built again in the 14th and 15th century it was restored in 1829-1833 when the west porch screen was designed as a royal pew for Queen Victoria. Around the cathedral are various aisles each with a different story to tell. Associated with the Albany aisle are two of Scotlands most powerful nobles, the Duke of Albany and the Fourth Earl of Douglas, accused of murdering the heir to the throne. The central pillar shows their coat of arms, however the chapel was later re-dedicated to the victims of the second world war. 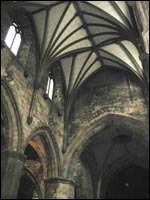 St. Elois aisle was built in 1410 by the guild of Hammermen (metalworkers), the Chamber aisle is dedicated to the publisher and Lord Provost William Chamber who undertook the cathedrals restoration in 1872. The Preston aisle was dedicated in 1513 and endowed by the man who introduced printing to Scotland, Walterus Chepman. The Moray aisle fashioned in 1830 out of three older aisles is named after the regent Moray, Mary Queen of Scots half brother, who was assassinated in 1570, and this is depicted in Holy Blood aisle on its window. Within the Moray aisle is also where the 1638 original signed copy of the national covenant is housed. Also represented within the cathedral are the old trade guilds of Edinburgh and their patron saint on the 19th century north porch screen, a monument to the Marquis of Argyll and a monument of the Marquis of Montrose. The famous Edinburgh born writer Robert Louis Stevenson has a memorial to his memory designed by American sculptor Augustus Saint-Gaudens. 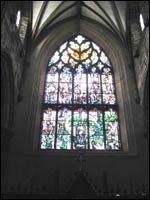 There is also a tribute to Robert Burns which is found in the west window and designed by Icelandic artist Leifur Breidfjord. St. Giles boasts an impressive church organ by the Austrian manufacturer Rieger. The glass paneled rear to the case allows the mechanism to be viewed in action. It was donated in 1992 by Alistair Salvesen.